One of the hidden gems of Los Angeles is the lush Descanso Gardens, located in the small town of La Cañada Flintridge, on the property of former LA Daily News owner E. Manchester Boddy. Contemporary architecture is a rarity in this area full of landscape and history, but a notable exception is the new Sturt Haaga Gallery of Art, an adaptive re-use and expansion of the historic Boddy House garage into art spaces by architects Frederick Fisher & Partners. Two galleries have been fashioned from the landmarked Boddy space, which had to be “rebuilt from the inside out,” as Fred Fisher put it, maintaining the historic shell but completely updating the rest. 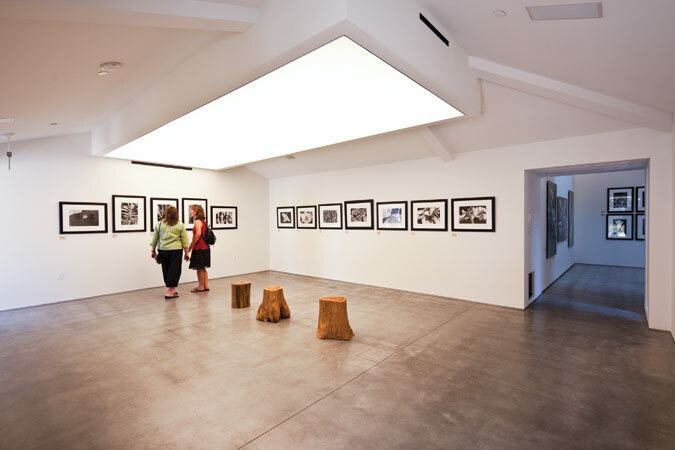 A third gallery was built from scratch and then camouflaged with green screen structures and tucked into a hillside with an additional outdoor room added for sculptures and events. “We used plant materials as brush strokes,” explained Fisher. Inside, the new gallery features 12-foot ceilings, a large skylight, and indirect lighting around the perimeter. In the existing spaces skylights could not be installed due to preservation restrictions, so much of their lighting is created through tucking fluorescent lights behind fabric and plastic scrims to establish a uniform illuminated surface.